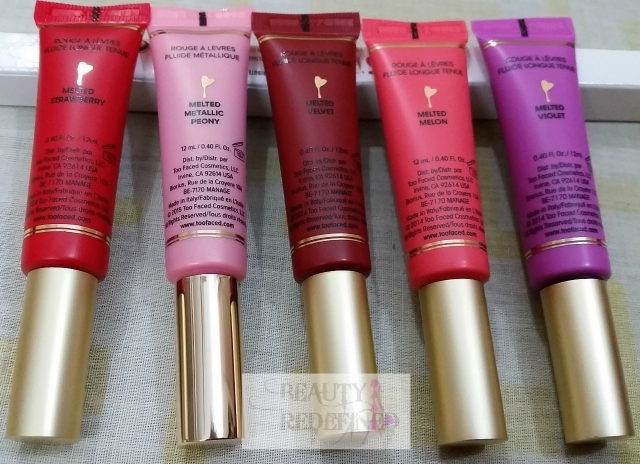 I love Lipsticks and I love Too Faced Lipsticks too ! So when they came out with these liquid lipsticks I knew I had to have them. Being a Lipstickholic 1 or 2 lipstick cannot satite my lust so i decided to buy 5 of them. Provides high-impact, super rich, saturated pigment in a long-wear formula. melted strawberry : Its It’s a bright, medium orangish - red with neutral-to-cool undertones and a glossy finish.melted metallic peony : is a light-medium pink with a mix of gold shimmer. melted velvet : It’s a deepened red with warmer undertones and a glossy sheen. melted melon : It’s a bold and bright neon orange with warm undertones and a creamy finish. melted violet : It’s a magenta purple with a satin/matte finish. Packaging : The cute Melted packaging caught my eye, It's so pretty and appealing. 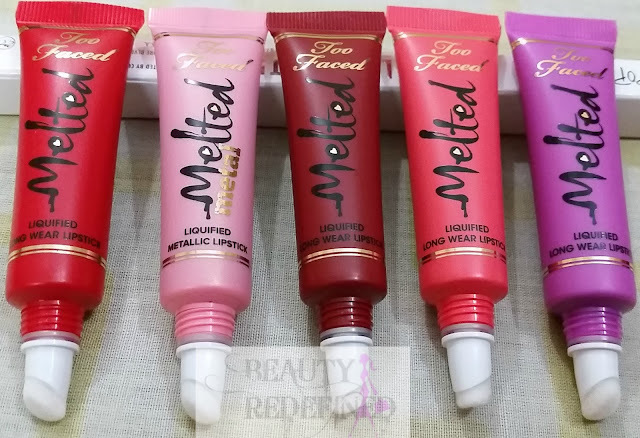 It come in a squeeze tube of same shade as that of the lipstick inside and Capped with Mettalic Golden Cap. Applicator: It has a white soft foam angular tip applicator. It comes out with a steady flow even if you apply it with pressure I applied leaving not much product to waste. Its preferable if you line your lips before applying lipstick from the tube it might bleed out. Texture : It felt lightweight, creamy and glossy but like a non sticky lip gloss! It was very soft and comfortable on the lips. It dries quite fast. Pigmentation : It's amazing when it comes to color pay off. It's highly pigmented and just a swipe had an opaque color payoff. I loved that it left a slight stain that didn’t look strange and it didn’t dry out my lips. Lasting : It transfers alot. It can be a literally a pain carrying these lipsticks while its glossy. Once the gloss fades away or should I say its completely transfers here and there, It leaves a stain which lasts for hours. But after a few hours you will need to retouch. Scent : the scent is very light and not even noticeable until you put your nose on the tube and sniff. Thank you so much, for this amazing post. 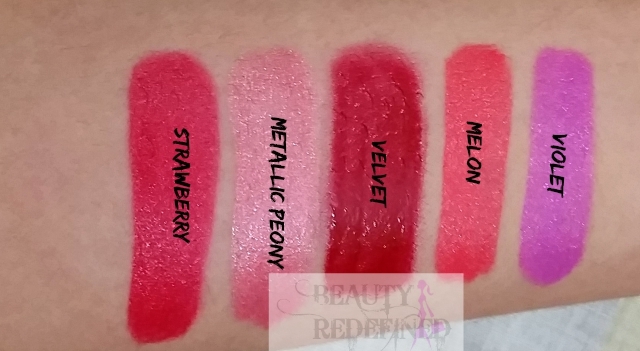 love the shade of the lipsticks especially melon and velvet. Would try it out and share my experience with you. Looking forward to some more amazing post by you. Thank you for the honest and detailed review. Velvet is such a beautiful shade. That's a great idea to use a lip sealer to help with the transfer, I never thought of that! What lip sealer do you use/recommend?? I so want some of these, such pretty shades! They are really pricey but looks great. Melon is a beautiful shade. These are so pretty, what a shame about to transferring! I love the look of Melon. 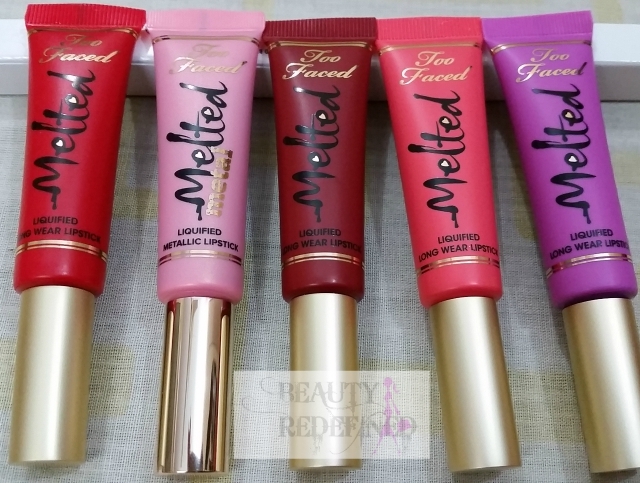 I have had my eyes on Melted Velvet and Strawberry for ever now!! Melon and strawberry are gorgeous. Ahh hate the fact these transfer a lot. Violet is a pretty color. But seriously $21 retail price for a single one and still it transfers a lot; this is disappointing!!! Interesting review. I have always been I te rested in buying these but shied away. But thanks your post it has helped me in making up my mind. I'm falling for velvet and melon. They are quite pricey.